Do you like making something special, during the holiday season for your family and friends? Then this little snowman made from a creamer bottle filled with a powdered drink mix could be just what your looking for this holiday season. It is really cute and you could put your own hot cocoa mix recipe, cinnamon vanilla mix, or your own special holiday drink mix in it. Material needed to make this cute little fellow is liquid creamer bottle, flannel, felt, buttons, wire, and of course your special drink mix. 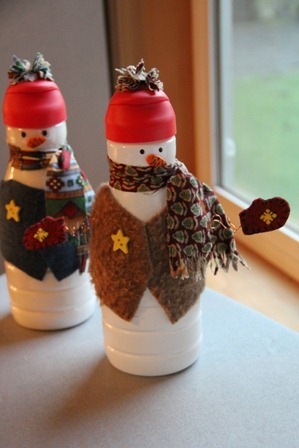 You can find the complete tutorial with pictures for making this adorable snowman at Crafty Staci’s Blog. There’s a recipe for Cinnamon Vanilla warmer mix too. I think these would make wonderful gifts. What do you think?